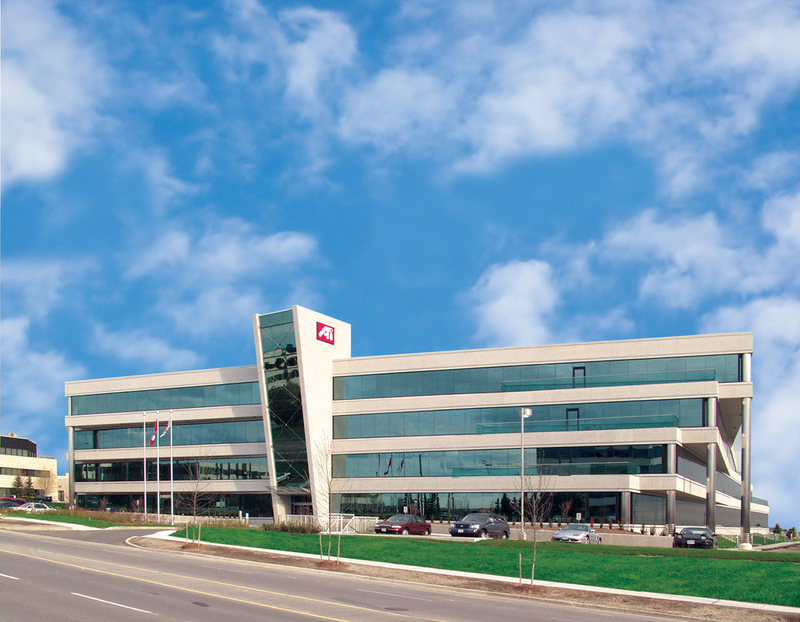 This suburban corporate office complex, located in Richmond Hill, Ontario, was completed in 2001. It is a four storey reinforced concrete structure, constructed over two subgrade vehicular parking levels. The structure is founded on reinforced concrete caissons and grade beams. Caissons are founded in natural silty clay tills capable of safely sustaining pressures of 1500 kilopascals and 2400 kilopascals, (ie. 31,320 pounds, 15.66 tons per square foot and 50,112 pounds, 25.01 tons per square foot) depending upon the location on the site. The P-2 parking level is a 100 mm thick concrete slab-on-grade with fibrillated polypropylene fibers. The P-1 parking level is a reinforced concrete flat slab with a thickness of 240 mm, and 150 mm deep drop panels, in the areas below the superstructure, where the bays are nine metres square. Beyond the limits of the superstructure, where the spans are in the range of six to seven metres, the flat slab thickness is 210 mm, with 100 mm deep drop panels. The ground floor area, within the limits of the superstructure, is a 270 mm thick reinforced concrete flat slab, with 150 mm deep drop panels, and 300 mm deep capitals, designed to carry loads up to 4.8 kilonewtons per square metre. Beyond the limits of the superstructure, the framing is a 300 mm thick reinforced concrete flat slab, with 150 mm deep drop panels, and 300 mm deep capitals, designed to carry loads up to 12.0 kilonewtons per square metre. The second, third, and fourth floors are similar and were designed to carry loads up to 2.4 kilonewtons per square metre. These floors are typically 220 mm thick reinforced concrete flat slabs, with 200 mm deep drop panels. Reinforced concrete beams were provided at outer bays to achieve the rotational offsets of the ascending floors. All of the floors, above the ground floor, feature a central six bay open atrium space, which is covered by a high roof level skylight between mechanical penthouse roofs. The roof slab is also typically a 220 mm thick reinforced concrete flat slab, with 200 mm deep drop panels, and beams, in the outer bays. The mechanical penthouses’ slabs are 320 mm thick, with 200 mm deep drops. The roofs of the mechanical penthouses are framed as a series of 150 mm and 180 mm thick one-way reinforced concrete slabs, supported on reinforced concrete beams. The skylight, between the roofs of the mechanical penthouses is supported on a series of five 840 mm deep, and two 760 mm deep structural steel beams.